Being a Big is This Simple. Seriously. or hang out at OTC for an hour. There are three ways to be a Big Brother or Big Sister. Before you are matched with your Little, Big Brothers Big Sisters of the Ozarks takes you through a 45-minute meeting where you will learn what being a Big. Our program team will give you more details about the programs we need volunteers for, our eligibility requirements and the steps you need to take to begin changing a Little's life for the better, forever. There is no commitment or pressure to become a Big at the orientation. Fill out the form below to RSVP or email therzog@bigbro.com. We have more than 100 children on our wait list to benefit from a life-changing friendship. Here are ways you can help us recruit their Bigs. Do you know someone who would be a terrific Big Brother or Big Sister? Tell us and we'll take it from there. >> Email us. We'd love to bring the coffee and donuts to your workplace, church, block party—wherever awesome adults who would make great mentors hang out. Host a recruitment presentation and help us invite others to make a lasting difference in a child's life. >> Email us. Tevon was struggling with behavioral issues at school. He had been suspended several times and he was having difficulty controlling his emotions during altercations with his peers. His mom worried he was developing a reputation would affect him harshly as a young African American male. Wanting Tevon to have a positive influence in his life, she brought him to Big Brothers Big Sisters of the Ozarks to find a Big Brother who can guide him. He was matched with Brandon in December 2016. Tevon’s Big Brother, Brandon, said he can relate to Tevon when it comes to the struggles of being a young African American male. 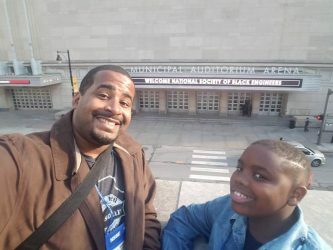 Brandon didn’t grow up with many positive male influences and felt that it was part of his responsibility as a successful black man to show other black males that they can be vulnerable, educated, and successful in life. Over the last year, Brandon has worked with Tevon on the difference between right and wrong, respect, and how to voice his feelings and opinions in a productive way. Tevon’s grades and school performance have also vastly improved since he and Brandon were first matched a year ago. His grades have gone from Bs and Cs — while getting suspended from school all the time — to As and Bs, and he continues to improve.